So far this has been a really nice area to roam around when it rains in the Cascades without needing to cross the bridge to the other side of the gorge. It’s also far enough from popular hikes around Ellensburg or Yakima to see anyone around. This was our third visit and we only ran into one hiker the first time we were here. Few people we came across by the parking area were either just picnicking or walking by the lake shore. We hadn’t explored the main trail that runs along side the Columbia River since I wanted to get some photos from higher up. That will probably be on the agenda for the next visit, be interesting to see whee that trail leads to. There isn’t much elevation gain once getting on top of the rim and one can venture out as far as they want. There is a hiker’s path at the top and it leads to the first high point on the edge of the rim. 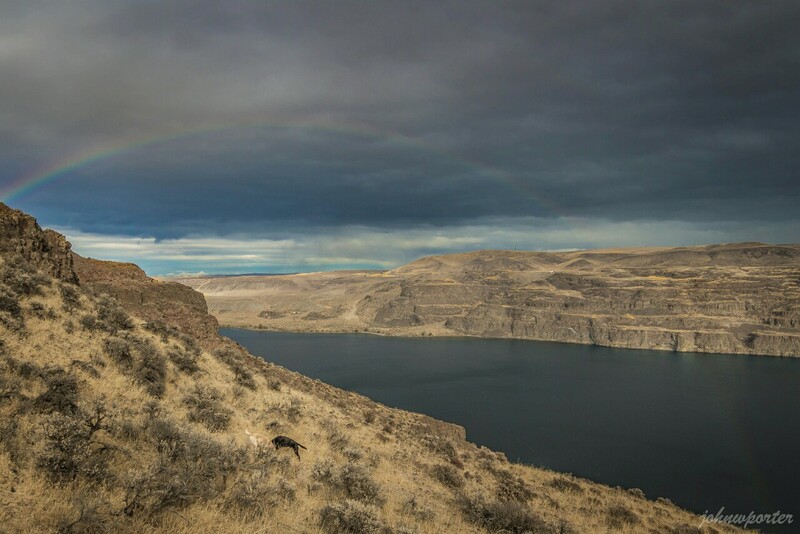 The high point is a perfect spot to take photos of the river including the Vantage Bridge. With a zoom lens you can even get nice closeups of Wanapum upstream. My plan was to venture farther north, but the pups and I couldn’t fight our way through the relentless wind gusts so we turned around at top of the slope. On the way back we made several stops along the rim to take photos, and spotted a group deer down by the river shore couple hundred feet below. They seemed to be unfazed by our presence when I made some noises to let them know we were nearby so they wouldn’t be startled. As we proceeded to hike back to the parking lot, I decided to drop lower to the base of the basalt rocks to connect up with a footpath I saw on our way in. The path contoured the basalt wall very nicely, with one narrow spot that required good hand and foot holds to get around. Next time I’ll check out the trail down by the shore.